The newest member of the Zoo’s Humboldt penguin flock, a female named Anchovy, hatched March 8, and is now on public exhibit. The chick’s biological parents are Mariano (5 years old) and Liberty (3 years old). Since Mariano and Liberty are very young parents and this marks their first clutch of eggs, Aviary staff decided to pull one of the eggs and give it to a more experienced pair of penguins to raise it. Mariano and Liberty were allowed to care for a second egg, but it was infertile and did not hatch. When Anchovy was still in the egg stage, she was given to her grandparents, Houdini and Anke, to be raised. 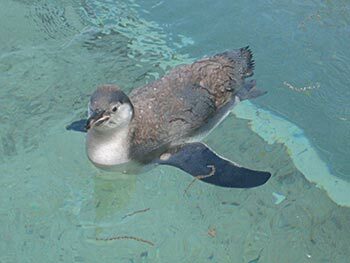 Houdini and Anke raised Anchovy as their own chick, feeding and protecting her and keeping her inside the exhibit until she was old enough to swim. Humboldt penguins, found in the coastal areas of Chile and Peru, must grow fast in order to survive from predators. Humboldt penguin parents keep their chicks inside the nesting area until they’re old enough to swim and can navigate the exhibit. At nearly 3 months of age, Anchovy fledged, leaving the nest, started swimming and was able to get in and out of the pool on her own. She loves the pool, and is often seen swimming and playing with the other penguins. The Milwaukee County Zoo has a long and storied history with the conservation of Humboldt penguins in their native range. In 1994, the Zoo initiated a long-term research program to study a breeding colony of Humboldt penguins in Algarrobo, Chile. Part of this study continues today, with the installation of artificial burrows to provide more sturdy nests than can better resist flooding and destruction than the natural dirt burrows. Visitors to the Humboldt Penguin Exhibit will be able to see Anchovy on exhibit outside, as she becomes more comfortable with her surroundings and navigates the rockwork. She is easy to recognize from her flock mates, as she is steel grey on the top of her body, and light grey on the lower portion. She does not have her stripes yet and will not get her black and white coloring until she is about 1 year old when she will have her first molt. At the end of June, zookeepers will take her off exhibit for weaning purposes, and she will return to public exhibit, about two weeks afterward. When visiting the Zoo, be sure to visit Anchovy!